‘How would you like to spend Christmas in Australia?’ enquired Tom. Music to my ears, as my youngest daughter, Kate, lives on the beautiful Sunshine Coast of Queensland and I hadn’t seen her in more than a year. I know that my blog is usually set in Italy, but I just had to share my Australian adventure with you. It was too exciting and happy to keep all to myself. 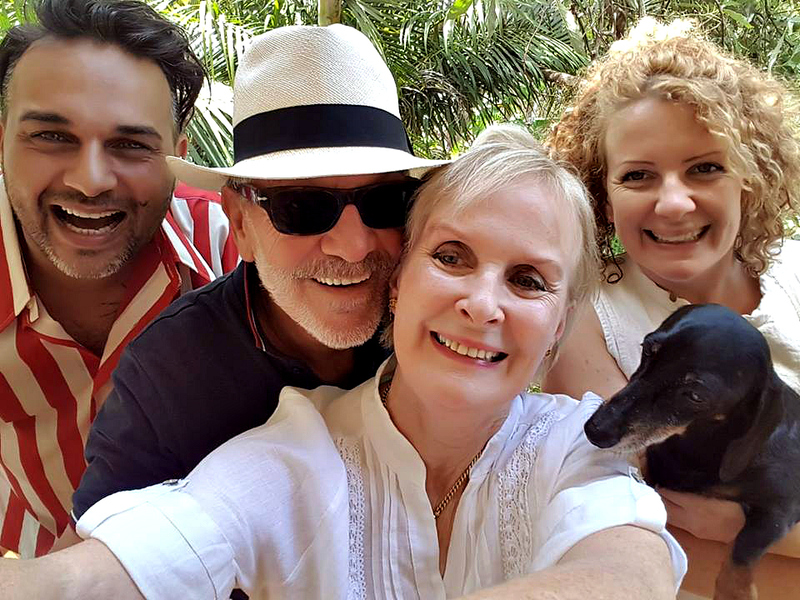 Met at the airport in Brisbane by Kate and her partner Jonny, plus their two dachshunds Rosie and Frank, we were whisked to Maroochydore on the Sunshine Coast in about an hour and half. I was buzzing with excitement and didn’t feel tired at all. Four weeks of uninterrupted bliss stretched ahead. Kate and Jonny welcomed us into their fabulous Queenslander home on stilts high in the trees near Rosemount. Jonny’s restaurant, Guru Life, also in Rosemount, is less than ten minutes from the coast and a really fun place to visit. 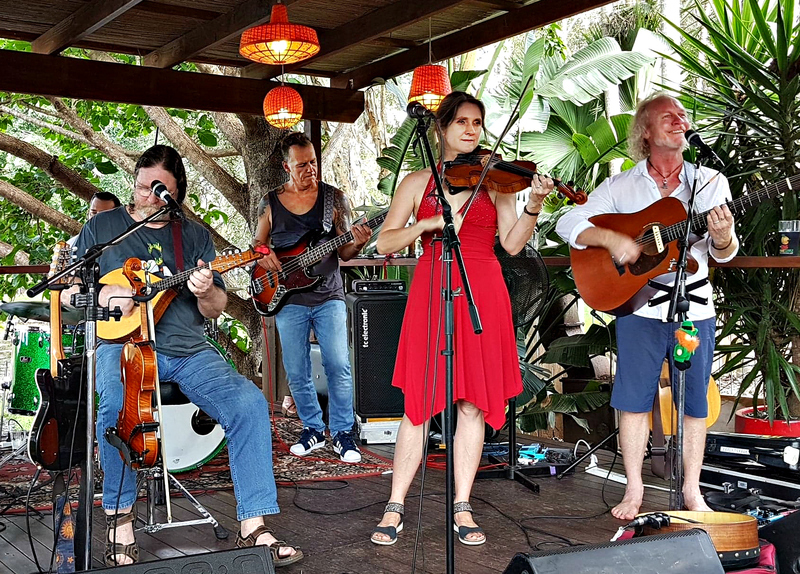 Quite apart from the excellent food – their ‘brekkies’ are fantastic – their jungle garden hosts regular music sessions and is a very lively spot. On one memorable Sunday their chef, Ben, cooked Irish stew and a traditional Irish group, The Barleyshakes, was laid on to play in my honour. What day that was! Of course, I had to visit the kitchen to inspect the Irish Stew before it was served! Tom and I spent four idyllic weeks in Maroochydore and every day was wonderful. We stayed at the Duporth Apartments overlooking the mouth of the Maroochy River where it flows into the Coral Sea. The river mouth has many sandbars and little Pincushion Island is at its extremity. We loved the town of Maroochydore too, jam packed with fantastic ethnic restaurants and happy holidaymakers. 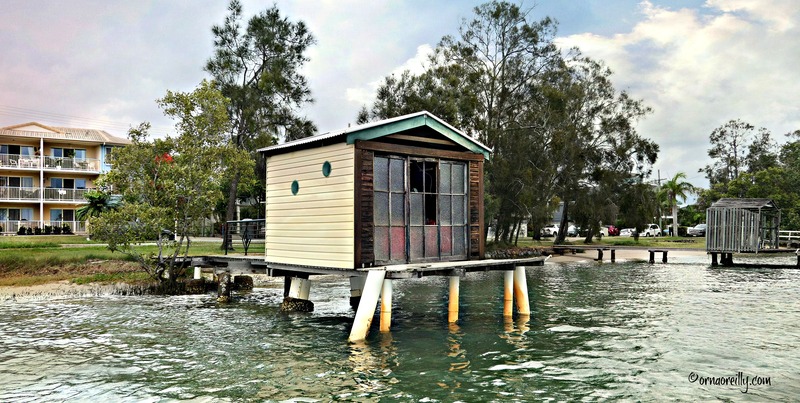 It is impossible to visit the Sunshine Coast without taking to the water by boat. For starters, the Maroochy River was there, literally on our doorstep, ready to be explored. We did this in several ways. On one occasion, we hired a pontoon from Swan Boat Hire, whose office consists of a small van parked along the riverbank. Kate, Jonny, Tom and I had an idyllic afternoon exploring the river and Petrie Creek. On another day, we explored the mouth of the river and all its sandbars by canoe, ably organised by Neil, who deserves many thanks for his help. He organised a large Canadian canoe for me and Tom, guided expertly and with a light touch on the outboard motor by Jonny, plus kayaks for the other, braver souls who were with us. Another day saw us heading to the Noosa Everglades. 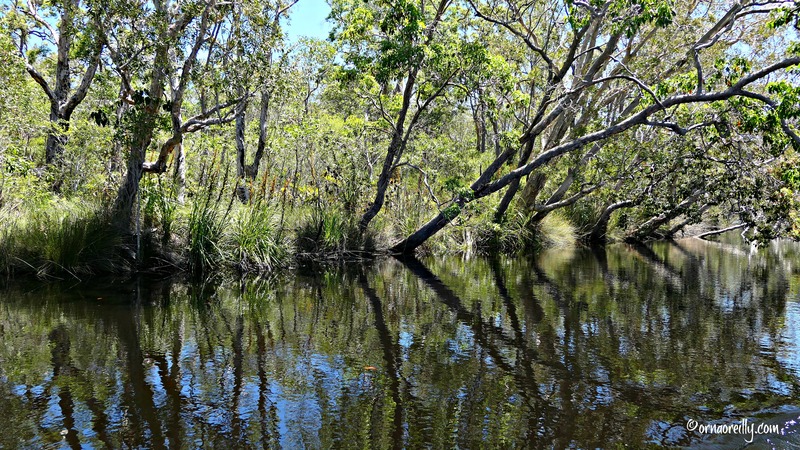 There are only two Everglades in the world, one in Florida and one here in Queensland. We drove to Boreen Point and were escorted across Lake Coothraba and up the River of Mirrors with Everglades Eco Safaris. This was one of the highlights of our trip and we had a magical day. On one memorable evening we all went on a Sunset Dinner Cruise up the Noosa River. This took two and a half hours and included a magnificent four course dinner. Another highlight for sure with Noosa Cruiser. One afternoon, Tom and I headed off in a tiny Haines Hunter Cruiser on the Noosa River. We hired it from Ready 2 Go Boathire. To be honest, this turned out to be a bit hair-raising. The little boat was difficult to steer, only managed 6 knots downriver, and the river itself was extremely busy with speedboats whizzing by, some dragging youngsters along behind in little rubber dinghies. I thought this was very dangerous and it scared me quite a bit. Tom kept his head, however, while I squealed in terror the whole way down the river to our picnic spot, and the whole way back again. Never was I so glad to step onto terra firma once more. 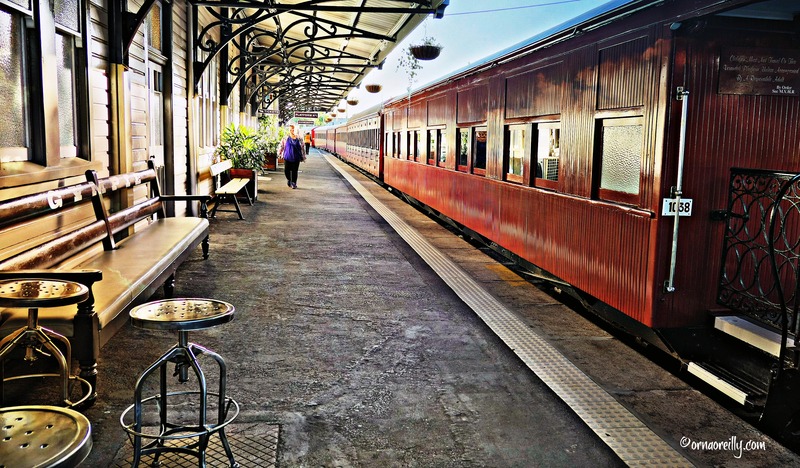 More suited to my preferred pace was an afternoon spent chugging across the picturesque Mary Valley on a steam train named the Mary Valley Rattler from Gympie to Amamoor and back again. In Amamoor the engine was turned around on a turntable and attached to the other end of the train. The result was that we began our trip in the end carriage and finished it at the front. We booked the Club Car where we were served wine and cheese in great comfort as we relaxed and photographed the beautiful countryside. A stop at Dagun for a wine and cheese tasting was included, but we had imbibed well by then and regretfully declined the opportunity. Maroochydore Beach was within five minutes walking distance from our apartment. With its huge waves and wide sands, it is an idyllic spot. ….a busy resort with a great fishmarket. Coolum Beach is just north of Maroochydore with a long boardwalk, a safe, patrolled beach, dominated by squat, round Mount Coolum. Further north is famous Noosa, with its sheltered beach, busy Hastings Street and excellent restaurants. Montville, a small town in the hinterland, about 400 metres above sea level, is very pretty. Lots of little shops and quaint houses to be seen. Maleny is a bit higher than Montville at 425 metres. 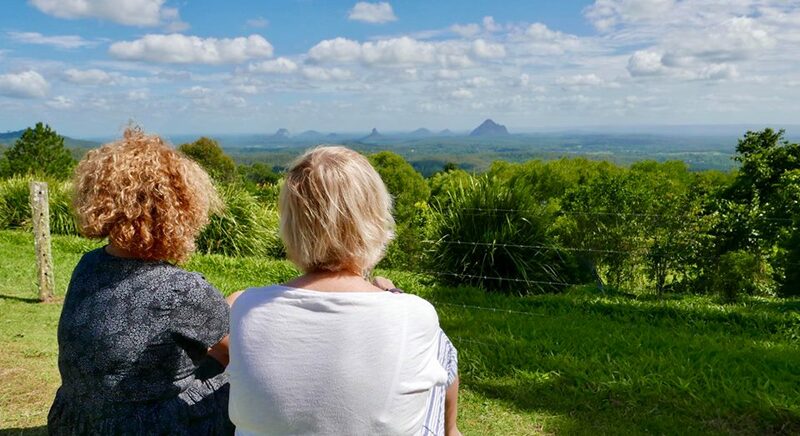 From there we drove out to the Mary Cairncross Scenic Reserve from where the view of the Glasshouse Mountains is stunning. These mountains consist of 13 volcanic peaks, the highest of which is Mount Beerwah. On this trip, I drove all the time. In Australia, as in Ireland, the driving is on the left so I am well accustomed to changing from side to side. This suits Tom very well! However, Australia is probably the easiest country in the world for drivers: all is orderly, with suitable gaps between cars and no tailgating. A real pleasure! Australia Zoo warranted a visit too. It is located near Beerwah and is owned by Terri Irwin, widow of famous Steve Irwin, the Crocodile Hunter who was tragically killed by a stingray in 2006, aged just 44. As this was one of the most wonderful holidays either of us has ever spent, we’ll be going back as soon as possible. You sure had an amazing Christmas in a very beautiful part of the world. I have spent a lot of time on the Sunshine Coast but never knew about the Everglades up there. How fabulous is Australia zoo. Steve sure walked the talk. Great post with beautiful photos. 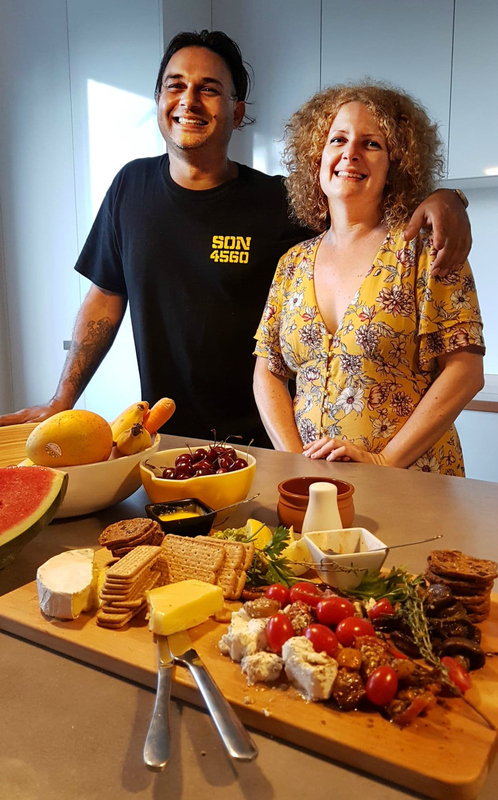 We had a fabulous time, love the Sunshine Coast and Australia in general. What a well organised country and so beautiful. Can’t wait to return. Maybe it needs a www link? How odd Dermot! I can see all the photos as I have just scrolled down to your comment. I have no clue how that’s happened to you. Try just http://ornaoreilly.com and let me know how you get on. Or just http://www.ornaoreilly.com. Orna (and Tom), I was happy to see your post, as I’ve been thinking about you and wondering how life was treating you. Quite well, obviously!! What a wonderful treat and time you had! This also came at the perfect time as we’ve been right in the middle of some of the coldest weather on earth, right here in the Chicago area. A dubious distinction, but so it goes. Tomorrow we expect balmy mid-twenties Fahrenheit which, trust me, will feel like a heat wave. Until then, I’ll bask in the sunshine you shared here. Four weeks went by so quickly! I enjoyed following your adventures as they unfolded on Facebook and it’s great to read the details and see more of your beautiful photos here on your blog. That excellent group selfie definitely set the tone for your vacation! I do so hope that the Queensland Monsoon floods in February have not affected your family. Not at all. Thankfully! My daughter lives more than 1200 Kms south of Townsville. And she is inland and uphill too. Quite safe.